Cain and Abel bring their offerings to God. FTER SIN CAUSED God to shut Adam and Eve out of the beautiful home that he had made for them, they built a home for themselves somewhere outside the garden gate. Here they began to feel more and more the punishment which their sin had brought upon them. Adam had to toil hard and long to secure food for himself and for Eve. No doubt his hands and feet were sometimes bruised and torn by thistles and thorns. Eve too learned the sad meaning of pain and sorrow. Her home was not so happy as it had been before she listened to the tempter's voice, and chose to disobey God. But all the while God loved Adam and Eve. We can not know how great was his grief when they sinned. No longer could he walk and talk with them as he had done before. Now sin, like a great, black monster, had stepped in and spoiled their friendship, and where sin dwells God will not go. No doubt Adam and Eve were sorry, too. No longer could they have God's presence in their home because sin had fastened itself in their hearts. But because God loved them still, he gave Adam and Eve a promise of a Savior. And because they believed the promise, hope came into their hearts again. Although they could not talk to God as they had done in their garden-home, now they confessed their sins to him, and it appears certain that they brought gifts which they offered upon altars. These altars they built by piling up either stones or earth, making a flat top, and placing on the top some wood, all cut and ready to be burned. Next they laid their offering upon the wood, then set fire to the wood, and that burned up the offering. We are sure that Adam and Eve must have felt lonely, with no friends in all the big, wide world. But God planned that there should be more people, and so one day he gave Adam and Eve a little child-a baby boy. This baby they named Cain. How they must have loved him! After a while God gave them another little boy, and they named him Abel. When Cain and his little brother Abel grew old enough to understand, Adam and Eve told them about the great God, and how they themselves had disobeyed him before Cain and Abel were born. They wanted their sons to love this God and try to please him. But alas! sin, like a tiny seed, was already buried in the hearts of these little boys, causing them to think naughty thoughts, or say unkind words, or do wrong deeds, just as little boys and girls are tempted to do today. Abel wanted to please God and he was sorry because he sinned; but Cain allowed the tiny sin-seed to grow and grow until his heart became very wicked. By and by Cain and Abel became men, like Adam, and Cain worked in the fields raising grain and fruits, while Abel took care of a flock of sheep. These brothers built altars, upon which they offered their gifts to God, as their parents did. 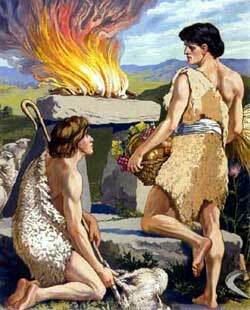 Cain brought for his offering fruit from the field where he had labored, and Abel brought a fat lamb. But Cain's offering did not please God. When he saw that God was displeased, he became very angry. God talked to him. He warned him of the harm that might come if he should continue to be angry instead of becoming sorry for his sins. But Cain was not willing to listen; he was not sorry for his sins. Abel believed the promise which God had given to his parents, and when he offered his gift he prayed and asked God to forgive his sins. God was pleased with Abel's offering. One day while the brothers were together in the field, Cain quarreled with Abel. Now, we are sure that nothing good can come of quarrels, because they are so wrong. This quarrel ended dreadfully. Cain grew so angry with Abel that he killed him. What an awful deed! God spoke again to Cain, and asked, "Where is Abel, your brother?" Cain replied, "I know not. Am I my brother's keeper?" Wicked Cain did not know that God had seen all he did. And now for a punishment God told Cain that he must leave his old home forever. Now at last Cain felt sorry, but he was sorry only because he was to be punished for his sin. He thought God was punishing him more than he could bear. Then God placed a mark upon him that all could see, and by that mark they would know that God did not want them to kill Cain. After this Cain wandered far away into a land called Nod. There he lived for many long years. Adam and Eve lived a long time, and God gave them other children besides Cain and Abel. Then the time came at last when their bodies grew feeble with age and they died, as God had said they should when they ate the forbidden fruit.